Bursting with the flavors of chili peppers, coriander, cumin, black pepper and garlic, Durkee Fajita Seasoning mix has a kick of lime and mesquite, for delicious restaurant flavor at home. 1 ounce packet. 1. 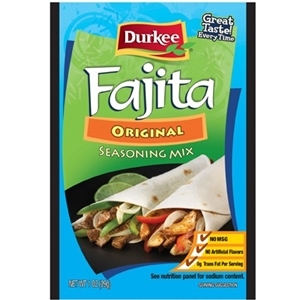 Combine Durkee Fajita Seasoning Mix and water in a dish or resealable plastic bag; blend. Add meat, turning to coat; let stand 15 minutes. 2. Heat 1/2 tbsp. oil in skillet; stir-fry vegetables 5 minutes; remove from skillet. 3. Remove meat from marinade. Heat remaining 1/2 tbsp. oil in skillet. Stir-fry meat until cooked through. Add vegetables; heat through. 4. Serve in warm tortillas with salsa, guacamole, shredded cheese and sour cream, if desired. Makes 8 servings. For a change of pace, try with pork tenderloin strips or shrimp. CHILI PEPPER AND OTHER SPICES, SALT, GARLIC POWDER, SODIUM DIACETATE, MALTODEXTRIN, ONION POWDER, FOOD STARCH-MODIFIED, SUGAR, CALCIUM STEARATE (FLOW AID), RED PEPPER, XANTHAN GUM, CITRIC ACID, NATURAL FLAVOR, NATURAL SMOKE FLAVOR.